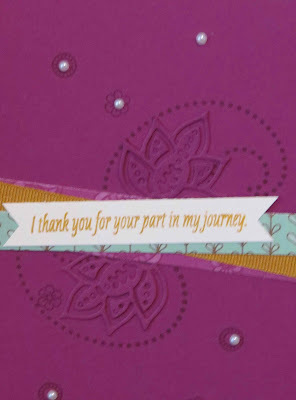 Karina's Kreations: Stampin'Up Petals and Paisleys! We have snow on the ground today so I feel like I need to post a few more fall cards before winter is here. This cute card was made by my friend Brenda using the Paisleys and Posies stamp set and Petals and Petals Designer Series Paper. I love she she stamped on Rich Razzleberry card stock with Rich Razzleberry ink and added two framelit pieces cut from Rich Razzleberry card stock. It's a really pretty look. I hope I have inspired you to stamp on this blustery day.